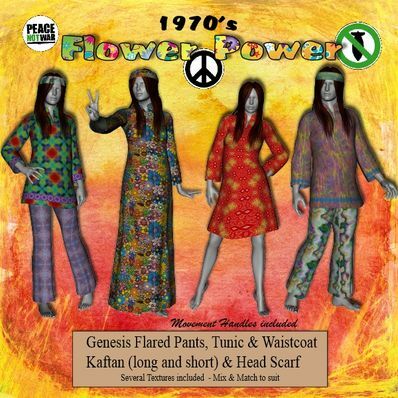 A 70s Flower Power Set for Genesis for use in Daz Studio 4.6. Flared Pants, Tunic, Waistcoat, Kaftan (long & short) and Head Scarf. Several Textures included, mix and match as you like. Movement handles included. Set collision of Waistcoat to the tunic or kaftan. Parent the head Scarf to Genesis or the hair. Some tweaking will be necessary to get it to fit the hair properly. Awesome, can see this many different textures that will go well with these outfits, thank you! Takes me back, thank you! Love & Peace! Thank you. Sorry but the People folder was missing. Now updated.